Today feels like a Hiplife/Azonto type of day, does it not? Perhaps that is because it's Monday. Or perhaps it is simply because I need a pick-me-up now that I'm starting my last 10-week quarter of my college career (Yippie!). Either way, this song is perfect. Don't let the name of this group fool you, 4X4 is a group of three guys - Captain Planet (Sylvanus Jeff Dodji), CoDed (Russel Edem Avornyo), and Fresh Prince (Prince Tamaklo) - who combine the different styles of reggae, R and B, rap, and hiplife to create an infectious sound. 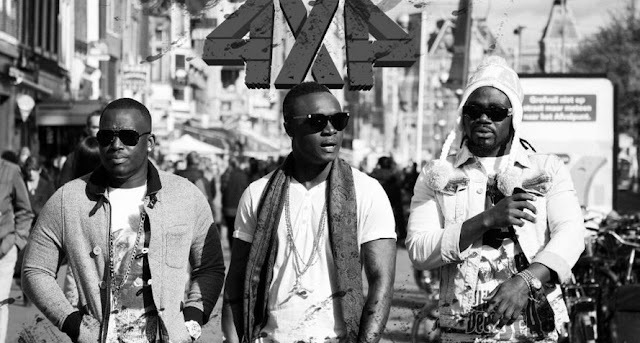 4X4 started way back in 2002 with the help of another popular Ghanaian group: Buk Bak. They became a near instant success with several successful hits. They rap in Twi , Ga, Ewe, and Pidgin English, but despite their lyrics being untranslatable to the non-Ghanaian ear, the beats alone in the music convey their own message that words cannot express. The song/video below is of the song 'Moko Ni'. Not only is it a great song, but it has a fantastic video which gives great glimpses of life in Ghana.